I WAS planning on celebrating Independence Day with the sweet, freeing release of BGP Pre-Alpha 7.0, but then I checked my emails and something came up... 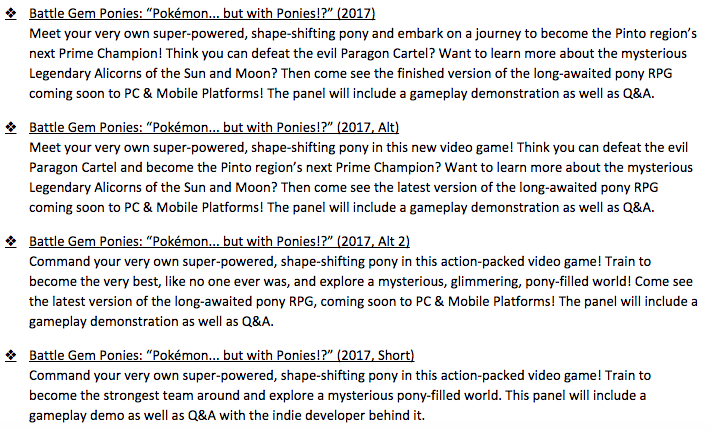 Turns out I'll be hosting the Battle Gem Ponies panel at BronyCon 2017 after all! 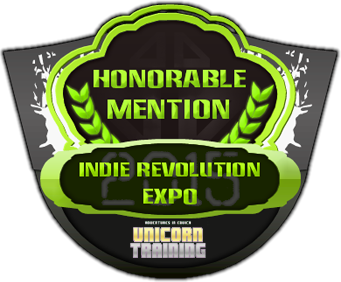 Now pressure's on because I have exactly one month to build an impressive Alpha to showcase in front of the biggest crowd yet. Dive on down below the page break for a time-capsule of this past week's gamedev events and plans for what's to come. 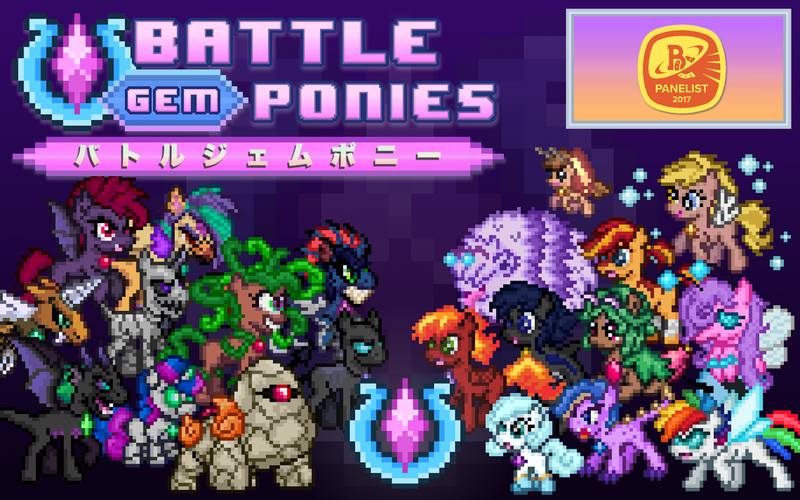 Battle Gem Ponies WILL be at BronyCon 2017! Here's me trying to decide which panel description to go with. I think I'm going with Alt 2 if I can. You know how people love their references. 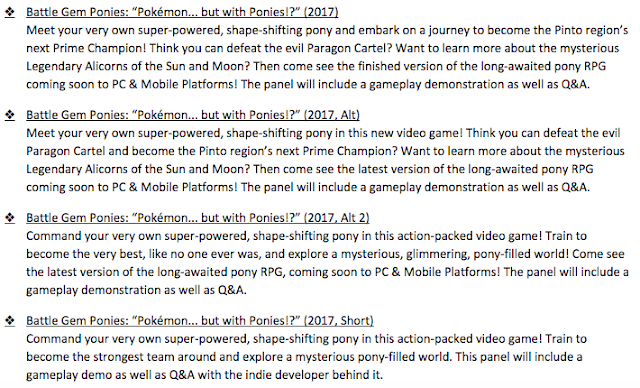 Really trying to drive home that anyone who loves both Pokemon and MLP will want to see this panel. An app store overhaul is coming, so I better have some catchy 30 character grabs ready. I found a nice way for special item/ability/move effects listed in spreadsheets to be broken down into simple If/Else cases whenever I need to. Which in hindsight is the easiest and most straight forward way to deal with all these special case scenarios, but hey, I'm only a decent programmer with a lot left to learn. I'm probably going to use this spreadhseet if/else breakdown in a lot of my future games. Recent car breakdown is adding urgency to getting this game out. Poor old rusty thing is on it's last legs and a replacement vehicle needs to be the first purchase I make after BGP comes out. During development I keep finding more efficient ways to deal with all the fancy Move, Ability, and Item Effects and can't help but rewrite everything to fix them and clean up my messy, messy code. So I decided to write out all that needs to be done in hopes of getting any more ideas out of my system. I decided to cut Oatmeal Mode as a way to save time. It'll make for good DLC a few months after launch when I have some time to test it and also have time to get valuable feedback to pair it with bug fixes and maybe even localized text for multiple languages. Hope it serves to save me dev time now and get me on the "New+Updated Games" section of the app stores. 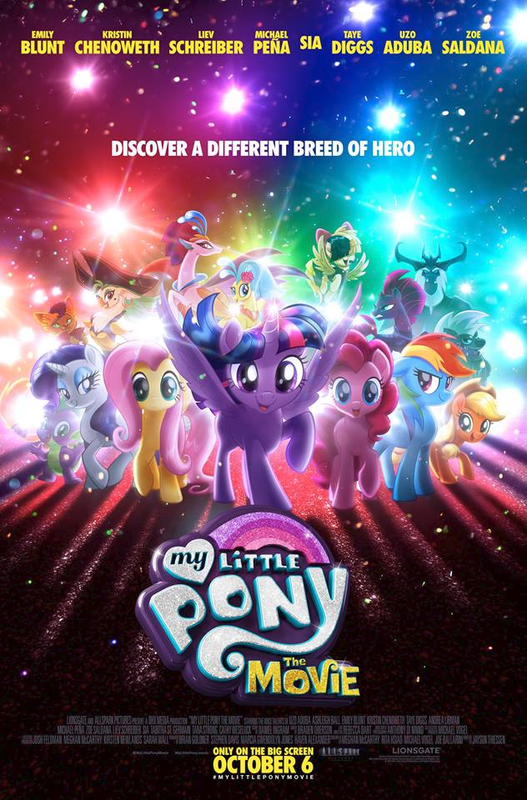 I have a feeling that this is going to cause a sudden rise in the number of people typing "pony" into search bars across America. Yet another reason to try to keep my deadline. 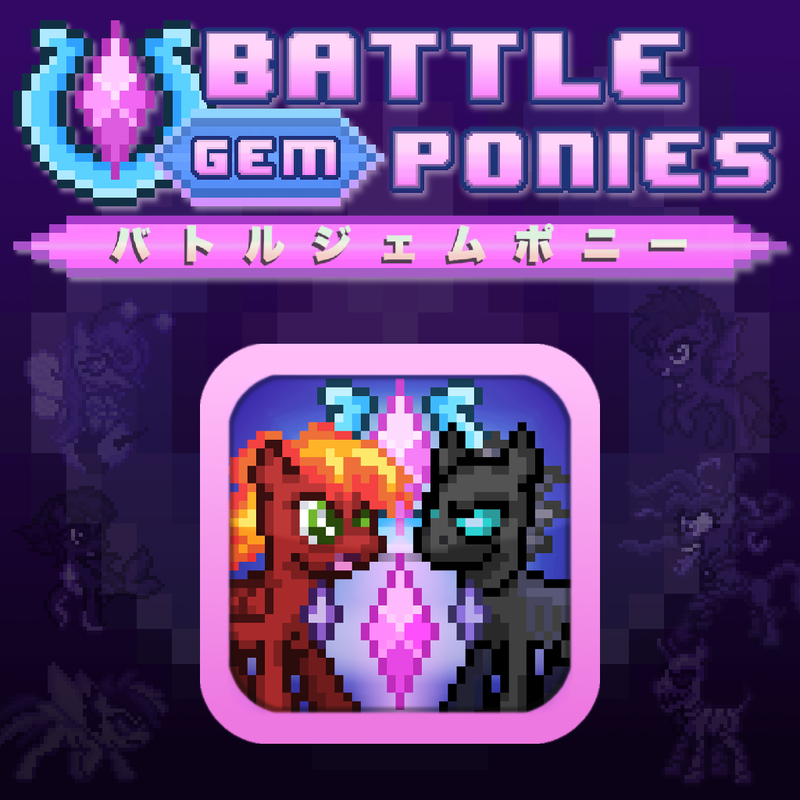 People looking to get their pony fix and curious former bronies coming back after years of absence will want some quality equine entertainment. Why not be the perfect example of a polished brony-made game? Hoping I can get this out on time. As long as I make it before Christmas... Just 3 more months til Beta... And 30 days til BronyCon... C'mon Yotes... It's on now.